Posted April 5, 2017 by Tony Jones & filed under Books. March brought a host of new Doctor Who releases from audio producers Big Finish, with the headline event being the climatic ending to Paul McGann’s epic ‘Doom Coalition’ storyline, a saga which has played out over four box sets. In the regular monthly ranges, the Fifth Doctor trilogy closed with the curious ‘Zaltys’, while Tom Baker and Lalla Ward headed to 1930’s Hollywood for ‘The Silent Scream’. 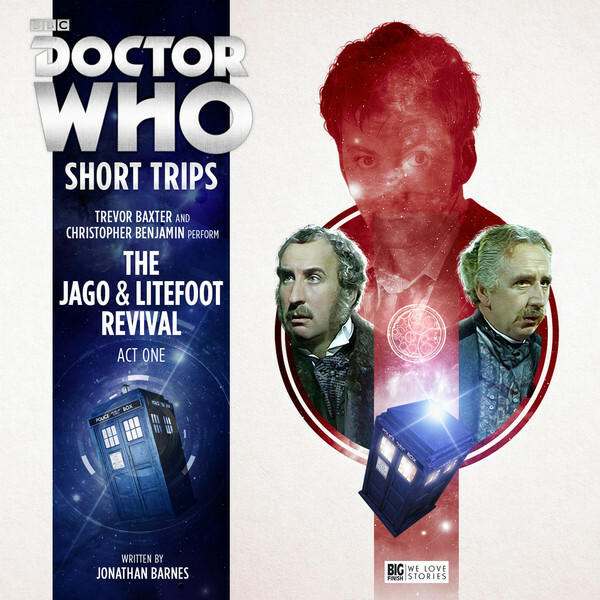 The Short Trips broke new ground with a double header, as Jago and Litefoot recall the first act of a two-part tale featuring the Tenth Doctor, while Charlotte Pollard, Edwardian adventuress and erstwhile companion to the Doctor(s), enjoyed her long-awaited second solo box set. 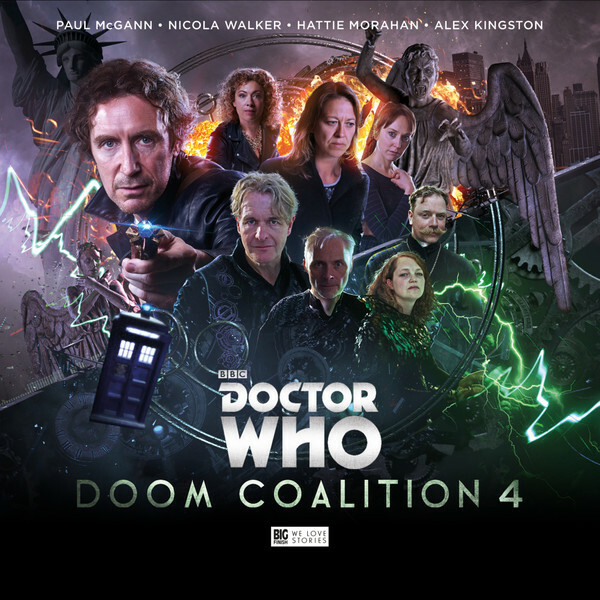 Concluding a sixteen part tale, the final ‘Doom Coalition’ box set begins hot on the heels of the last set, with the Eighth Doctor, Liv (Nicola Walker) and Helen (Hattie Morahan) fired off in an escape capsule towards certain death. While later episodes conclude the overall storyline in epic style, John Dorney’s compact opener, starring just the three principal cast members, is a terrific piece of character work which deals with feelings of hope and acceptance. As the tale expands out, we are treated to some memorable epic encounters from Matt Fitton. Firstly, ‘Songs of Love’ brings River Song to Gallifrey, with political skulduggery moving the plot forward as she works behind enemy lines, and then with ‘The Side of the Angels’, which sees Rufus Hound reprising his entertaining incarnation of The Meddling Monk, working with an earlier incarnation of Cardinal Ollistra (Broadchurch’s Carolyn Pickles) from The War Doctor series in the Weeping Angel infested New York. Finally, events come to a head on Gallifrey for John Dorney’s ‘Stop the Clock’, which admirably manages a satisfying conclusion to the entire endeavour – even providing a payoff to ‘The Red Lady’ which introduced new companion Helen Sinclair way back in the ‘Doom Coalition 1’. As well as the excellent trio of McGann, Walker and Morahan, for whom we hope there will be many more adventures, the guest list is positively stellar; Mark Bonnar (Apple Tree Yard) reprises his insane villain The Eleven, with Emma Cunliffe (Unforgotten) returning as The Sonomancer and Robert Bathhust (Cold Feet) as Padrac. Playing out across eighteen months ‘Doom Coalition’ has been a triumph in long-form storytelling, backed by terrific sound design and music. As well as building an expansive Time Lord conspiracy, with its roots in predictions of the Time War to come, there has been room for some superb slower, more emotional episodes such as the award winning ‘Absent Friends’ and plenty of fun involving Alex Kingston’s River Song with an earlier incarnation of the Doctor. The final tale leaves a few threads dangling and a character’s fate unresolved, so we look forward to them being pulled upon to form another epic tale in the future. 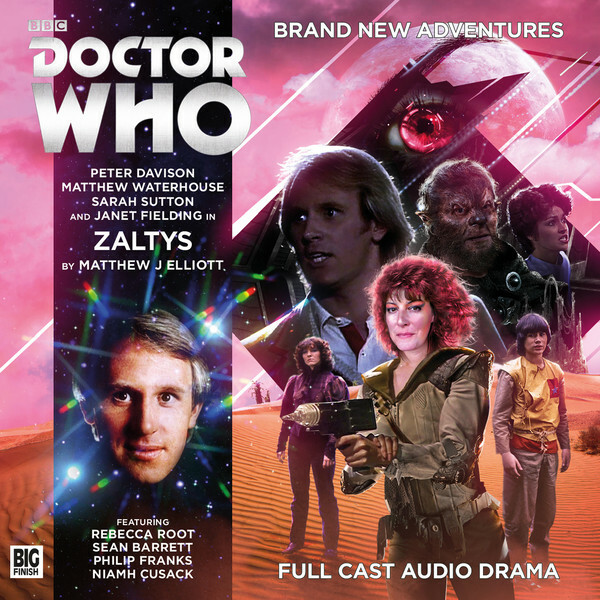 Finishing the current trilogy of stories for the Fifth Doctor and his Season 19 team of Adric, Nyssa and Tegan, writer Matthew J Elliot brings us the tale of a curiously abandoned planet. With the TARDIS crew drawn into the adventure thanks to Tegan’s goading of Adric to fly the ship, the story becomes a rescue mission as the pair vanishes from the console room. On the planet’s surface Nyssa and the Doctor encounter Sable, a hard-nosed scavenger who believes Zaltys to be a dead planet. However, scratching the surface reveals something far more complex. Playing with the all too relevant themes of isolationism and xenophobia, writer Matthew J Elliot, who was responsible for last year’s terrific ‘Maker of Demons’, has the period feel spot on; some superbly unsubtle foreshadowing was at play in Adric’s reading choice from the TARDIS library, while were are gifted a handful of pleasing continuity touches, such as the Doctor’s plans to overhaul the TARDIS console and his allusions to the fate of the Silurian races on Earth. Moreover, the story manages to be the sequel to an unseen adventure for the Third Doctor and Jo Grant – one which we would very much like to hear! Director Barnaby Edwards makes some excellent casting choices once again, with Rebecca Root (Boy Meets Girl) playing the remorseless Sable, while Niamh Cusack supplies Clarimonde’s honeyed tones – her conflict with Janet Fielding’s Tegan being a particular highlight. This month, regular subscribers also enjoy a bonus Subscriber Short Trips story as Paul J Salmoff brings the Fourth Doctor and Sarah Jane Smith to a jumble sale, where they discover a curio which has no place being there, or indeed on the planet at all. This is a fun tale and narrator Stephen Critchlow’s take on Tom Baker is an entertaining one, which admirably keeps the right side of parody. The story is also a rare outing for the much missed Sarah Jane and it showed the Doctor displaying an inclination towards cricket which would, of course, later inform his Firth incarnation’s sartorial choices. James Goss wrote this month’s Fourth Doctor Adventure ‘The Silent Scream’, and while it shares a name with Waly K Daly’s 1979 radio play, this is in fact a play on the phrase silent screen and is, for the most, a glorious recollection of 1930s Hollywood and the transition from silent movies to talkies. James can always be relied on to find a new angle to a quirky tale and ‘The Silent Scream’ continues the tradition. Tom Baker’s Fourth Doctor and Lalla Ward’s Romana are in Hollywood making the acquaintance of various actresses and movie makers. There’s much to recall such great movies as Sunset Boulevard, and there is, of course, a mystery. This particular mystery involves anachronistic technology and a cursed movie – everyone who auditions loses their voice! With K9 (John Leeson) in tow, the Doctor and Romana seek out Lorretta Waldorf (Pamela Salem) and actress keen to get a new role and now the possible target of the curse. They visit the film studio run by Lulu Hammerstein (Andrée Bernard) and find all is not as it should be. The final missing ingredient is Alec Newman’s Dr Julius, cosmetic surgeon to the stars. This mix gives Tom Baker plenty of scope to be both larger than life and curiously restrained, and James adds plenty of delicious irony to proceedings as he pokes at the fourth wall in a wonderful scene where Romana explains the point of acting to K9. Of course with James things are never as they seem, and without giving too much away, there is a rather effective horror story hidden away in the dark depths of ‘The Silent Scream’ and it only works as Doctor Who as it is buried in with the more traditional and family friendly story telling we are used to. It’s very well written and performed and the touch of melodrama Tom Baker brings takes some of the otherwise gruesome edge off proceedings. This is one of those stories that stays with the listener, and director Nick Briggs encourages the usual fine performances including Alec Newman and Big Finish regular Pamela Salem (normally heard in the ‘Counter-Measures’ range). Superb! Flexing its single voice format for the first time, with dual readers Christopher Benjamin and Trevor Cooper, this month’s Short Trip stars Jago and Litefoot. The beloved pair, who debuted in Doctor Who’s ‘The Talons of Weng-Chiang’ and have gone on to have more than a dozen series of their own audio adventures, chronicle an encounter with the Tenth Doctor, styled cleverly as a lecture from the Professor to his “Club For Curious Scientific Men”, with colourful interjections from Henry Gordon Jago. Splitting the pair, with Litefoot taking a trip to visit an archaeological dig on the Greek island of Minos while Jago deals with an infestation in the basement of the New Regency Theatre, writer Jonathan Barnes cleverly spins his tale with some misdirection and a couple of pleasing nods to both Professor Challenger and The Invisible Man, which he has recently adapted for Big Finish. It would be unfair to judge the story too much at this halfway stage, but suffice to say we enjoyed its slow build up and the sparkling repartee between the two stars, who bounce off each other with ease and genuine affection. We were delivered to an intermission by way of a cliff-hanger and a headwear related surprise, and encouraged to help ourselves to port and fruitcake… while we do, we look forward immensely to Act Two early in April! Charley and Robert find themselves in the London Underground at Embankment, along with a rogue Viyran (Dan Starkey), who later gets the name Bertram. In echoes of ‘The Web of Fear’ London becomes the victim of an attack from the tube, this time in the form of the Identical Men (Colin MacFarlane) and their mysterious machine. 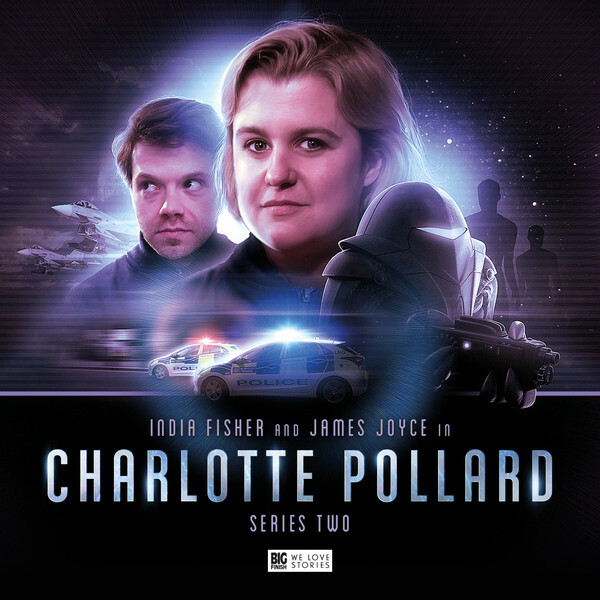 As the action unfolds Charley falls under the scrutiny of a government department led by Woking (Kieran Hodgson) who reports to a nameless minister (Rachel Atkins) and eventually the Prime Minister (Pippa Haywood) appears. In style it’s very different from normal Doctor Who fare, with Charley and Robert escaping a series of traps in the company of Bertam who has been markedly changed by the Prolixity. On the way they also meet a journalist (Deirdre Mullins) and a Rab the hacker (Ashley Kumar). By the end London is under martial law, some of our heroes are in a concentration camp in Slough whilst others are trapped on an alien world, lost in time. The music and direction give this a dark tone and the ending is particularly surreal. Nick Briggs (who wrote and directed) has stamped his mark on the series with great panache. This is also where some problems arise. Charley is in some sense a surrogate Doctor in these stories with Robert her companion learning how to survive crazy adventures. Beyond that she is passive, often waiting to be rescued rather than leading. To a large degree Bertram is the character most central to the story, and in setting out a new direction Nick has broken a lot of links back to Charley’s past. The London of these stories has no UNIT, no experience of time travellers (that we can find) and at no point does Charley sense anything is up. All the characters are well played yet some are ciphers – Woking runs a department with no facilities apart from an office and some soldiers. Rab the super-hacker can work miracles from his laptop (whose battery never fails) in ways that undermine the whole point of Woking and his resources. Fans may well find this set of stories isn’t what they had in mind. How they react to this change of direction may determine if we get a third set or not. If we don’t we’ll never learn what happened next! The Torchwood audios continue to surprise and revel in the show’s boundless possibilities. Kicking off the third run of monthly stories, the trend continues as ‘Visiting Hours’ puts Gwen Cooper’s long suffering husband Rhys Williams (Kai Owen) front and centre. Proving that it is not only the core Torchwood team who attract trouble, Rhys encounters something he describes as “not really his area of expertise” as he visits his mother in hospital, as she recovers from a hip operation. With Welsh acting royalty Nerys Hughes reprising her role as Brenda, who we first met in the television episode ‘Something Borrowed’ for Gwen and Rhys’ eventful wedding, there is ample scope for comedy and pathos. Brenda, thought a little giddy with the morphine, can still chide her son off for swearing and there is room for Rhys to thrill at the prospect of a blue parking badge. The threat, though almost secondary to the badinage between these two wonderful lead characters, is an interesting one and the pairing of Karl Theobald (Twenty Twelve) and Ryan Sampson (the brattish genius Luke Rattigan from Doctor Who ‘The Sontaran Stratagem) makes for an entertaining dynamic. It is a good thing too, as the underlying premise within the hospital setting of David Llewellyn’s story is incredibly ghoulish. 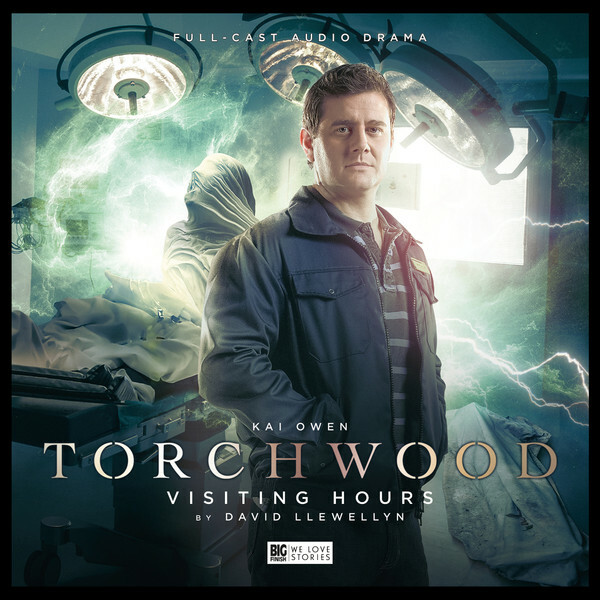 While he may not have been one of the poster boys for Torchwood on the television, Kai Owen is terrific in these audio dramas. Far more than just the comic relief, he excels at bringing Rhys, the ordinary bloke in extraordinary circumstances, to life.